Puppets are brilliant for rainy days—or just those pockets of time when your tot is done with the Duplo and looking for something a bit different. They spark hours of imaginative play, storytelling, and by default, language development—what’s more, if you make the puppets, together with your little one, the activity will help hone her all-important fine motor skills. 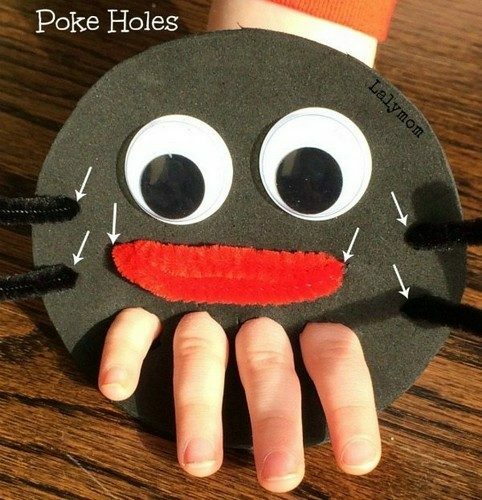 Check out how to reincarnate the eternally beloved arachnid, Incy Wincy Spider, as a hand puppet. Place the plastic lid rim-down onto the craft foam, pushing down firmly around the edge to create a circular impression. Repeat with the Sharpie Marker lid to create 4 small finger holes. Cut out with a craft knife or scissors. Gently poke two holes on either side of the craft foam circle. Push through the black pipe cleaners from the back. These are the legs. Fold in half the red pipe cleaner. Below the eyes, poke two small holes through which you’ll feed the pipe cleaner. This is the mouth. Done! Now get your littlie to join in with the song and help her learn the actions, too! 5 Brilliant Baby Apps for When You’re ExpectingWill Brazil Nuts Help Me Conceive?